wait, was it already that high in March and I just have bad memory? Also I might subway in from Penn Station since it'll be late. Is the K-Mart/NYU station still closed? I think it might have gone up since March. You can either go to the 8th Street/NYU station on the R or the Astor Place station on the 6 train. Where can I find the booth? I'll be leaving tonight to head to New York to be at World Maker Faire and I'd like to stop by. That's awesome! Are you attending or exhibiting? 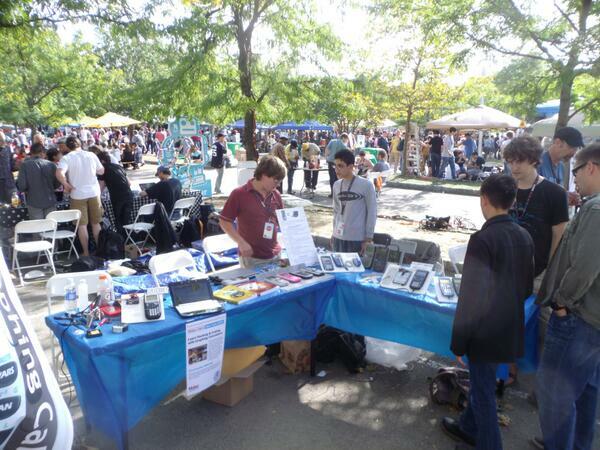 I don't know exactly where my table will be, but we will probably be outdoors like last year, with a big "Hacking Graphing Calculators" banner. Do you think you could set up a camera with time lapse to take a picture every few minutes or so? That way, members like me who can't visit can get a sense of how many people visited? Sounds like it was a great time! Wish I could have checked the IRC log, but I had my hands full trying to figure out why I couldn't log into Minecraft. We're actually here again today. The day is almost over; when I get home tonight, I'll be posting a full article all about the Faire, the people we talked to and the cool stories we heard, and the awesome award we got! Don't know whether to post this here or on the news article. Fascinating, thanks for sending that along. There was a venue recently in Washington, DC called the USA Science & Engineering Festival that we unfortunately didn't attend, as we would have had to invest a substantial amount of money just to exhibit there. Presumably this Maker Faire doesn't work the same way; it looks like something worthwhile to at least try tweeting at to see what happens. © Copyright 2000-2019 Cemetech & Christopher Mitchell :: Page Execution Time: 0.248985 seconds.